Months after it announced a new Chief Executive who promised to hear feedback from customers, United Airlines responded, it will reintroduce free snacks beginning in February. Breakfast snacks, which the airline calls a small piece of caramel heavy between crispy wafers, are amongst the free snacks that United will be providing its economy fliers. The airline has not served any free snacks since 2008. In 2010, Continental merged with United and quit offering snack service just after the merger took place. Food represents an important part of the experience of flying for customers, said a United spokesperson after the airline had announced the change. 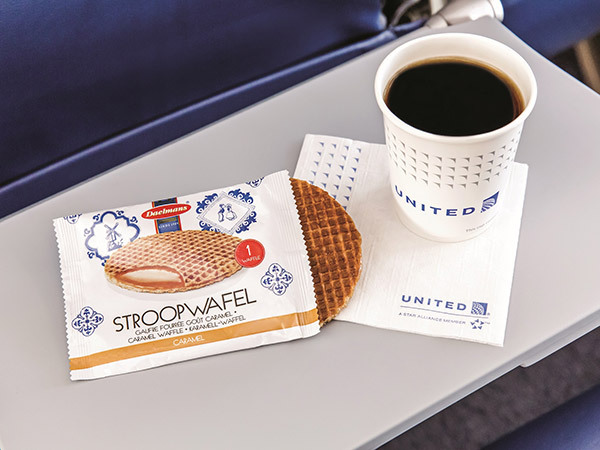 Stroopwafels one of the breakfast snacks to be offered are traditional cookies from Holland and will be served on all flights that depart prior to 9:45 a.m. The airline suggests that passenger set the pastry on their hot coffee to help warm it up. Passengers that take a later flight will be able to choose from a snack mix that is Asian-style with sesame sticks, wasabi peas and rice crackers, or a zesty ranch mix that has mini pretzels, soy nuts and corn sticks. Those snacks will be served on daily flights in both North America as well as Latin America. United said that the return to free snacks comes from the campaign to listen to customers. Part of that campaign includes website unitedairtime.com that Oscar Munoz the CEO uses to seek employees and customer feedback. Munoz took over the top spot last September after Jeff Simsek the former CEO left due during an internal investigation that related to a probe by the federal government of the dealings the airline has with the Port Authorities of both New York and New Jersey. Munoz currently is on leave for medical reasons after he suffered a heart attack October 15. One blog writer in the airline industry calls free snacks a good gesture on the part of the airline and due to consolidation going on in the airline industry it is import as it helps to compete with other airlines besides in just airfare costs.